This fine architectural fragment , which is now in the Museo Capitolare, apparently came from San Domenico. The art historian Valentino Martinelli attributed it to Giovanni Pisano and suggested that it once belonged to a capital. The earliest secure reference to this important panel dates to the 19th century, when it was in the Convento di San Domenico, near the door leading to the sacristy of the church. It was probably commissioned for the high altar of the new church of San Domenico, which was begun in 1304. However, the construction of the new church turned out to be a protracted business, and the altarpiece must have been housed, at least for a time, in one of the other churches at the convent, either San Stefano del Castellare or San Domenico Vecchio. It was moved to the Galleria Nazionale in 1863. Bernard Berenson attributed it to Duccio Buoninsegna in 1897, and this attribution has never subsequently been questioned. A recent restoration has revealed that it was originally the central panel of a polyptych: this would have been one of the first polyptychs in Umbria. The commission was broadly contemporary with that of Duccio's polyptych for the Dominicans of Siena (the so-called Polyptych 28 in the Pinacoteca Nazionale, Siena - ca. 1306). In the Perugian panel, the Madonna points to the hands and feet of the Child, prefiguring His Crucifixion, while six praying angels look down from spandrels above the fictive semicircular frame. The naturalistic representation of the figures is closely related to that in Duccio’s famous Maestà (1308-11) from the Duomo, Siena. ✴St Elizabeth of Hungary (who had been canonised in San Domenico in 1235), with the Virgin Annunciate above (on the right). This is universally accepted to be the “very beautiful panel” that, according to Giorgio Vasari, Gentile da Fabriano painted for San Domenico, and it is usually dated to the period in which Gentile lived in Venice (ca. 1402-14). It was probably commissioned by Fr Bartolomeo degli Acerbi, who was Prior of San Domenico and, from 1404, Prior of the Roman Province of his order, and who had close ties to Doge Michele Steno of Venice. There is no surviving documentation that relates to the panel until 1861, when it was in the chapel of the Novitiate, inside the convent. It entered the Galleria Nazionale in 1863. Maria Rita Silvestrelli (see the page on the artist) has suggested that it was originally in the Cappella di San Giacomo (now the sacristy) and that its frame bore the arms of the Graziani family. The panel, which has been cropped at the sides and cut down at the top, was clearly originally in a trefoil frame. It might originally have been the central panel of a triptych or polyptych, but the fact that Vasari mentioned only this panel suggests that, if so, the work had already been broken up by the 16th century. Nothing is known of any other components, if indeed they did exist. ✴The Virgin is seated on a throne that is covered with vegetation, which was probably conceived as the hortus conclusus (enclosed garden, a symbol of virginity). ✴Three pairs of angels are stippled into the golden background: one pair crowns the Virgin while the other four angels present her with lilies (symbols of purity). ✴Seven tiny angels (now very damaged) hold a scroll inscribed with the antiphon Regina Coeli (Queen of Heaven). ✴Other inscriptions in the Virgin’s halo and along the edge of her cloak add further praise. ✴The Virgin presents the Child with a pomegranate (the symbol of the Resurrection). This was one of the first examples of what is now called International Gothic art to appear in Perugia. The fine workmanship of the golden background was fully revealed by the restoration carried out in 1994. Benedetto di Bindo was paid in 1415 for the design of the stained glass for sacristy. Unfortunately, it was destroyed when the sacristy was re-modelled in 1665. This panel from the Cappella degli Apostoli, which is signed by Pellegrino di Giovanni and dated 1428 (‘PEREGRINUS PINSIT MCC [C] C XXVIII’), is his only securely attributed work. It contains the arms of Nicolò di Giovanni di Benedetto di Giovanni, who presumably commissioned it. It probably formed part of a triptych or polyptych. The panel was moved to a small church at Vaiano, some 35 km from Perugia in the 18th century and sold to the Victoria & Albert Museum, London in 1860. In the panel, the Virgin is seated on a throne that is covered with vegetation and surrounded by angels, with the naked baby Jesus on her lap. The composition of this panel was modelled on the panel (ca. 1405) of the Madonna and Child by Gentile da Fabriano from San Domenico (above) that is now in the Galleria Nazionale. The panel retains the upper part of what seems to be its original frame, with a small figure of King David in the pinnacle above. (A panel (1435) that Giovanni di Martino Bontempi commissioned from Pellegrino di Giovanni for the Cappella degli Angeli no longer survives). This polyptych was first documented in 1548 in a description of the Cappella di San Nicolò, which belonged to the Guidalotti family. This description noted that Elisabetta Guidalotti had decorated the chapel and identified Fra Angelico as the painter of the altarpiece. Elisabetta’s efforts in the chapel, and in particular the commission of an altarpiece from such a noted Florentine artist, were probably intended to help restore the prestige of her family after its disgrace following its part in the murder of Biordo Michelotti in 1398. A 17th century document records that the altarpiece was commissioned in 1437, although modern art historians generally date it on stylistic grounds to the 1440s. The figure of St Nicholas of Bari seems to be a portrait of Pope Nicholas V. It has been suggested that Fra Angelico painted this polyptych in late 1447, en route from Orvieto for Rome. ✴SS John the Baptist and Catherine of Alexandria (with her wheel) to the right. The figures in these three main panels share a unified space behind the divisions imposed by the framing. This space has a natural appearance, despite the somewhat anachronistic gold background. It has been suggested that Fra Angelico was intent upon reconciling his own “modern” conception with his client’s desire for a sumptuous, albeit “old fashioned” appearance. ✴three predella panels, which depict scenes from the life of St Nicholas of Bari. ✴Dominique-Vivant Denon, the Director of the Musée Napoleon (later the Musée du Louvre) selected two of them in 1810, and they were duly shipped to Paris. Antonio Canova recovered them in 1815, when they were secured for the Pinacoteca Vaticana, Rome. ✴Agostino Tofanelli, the Director of the Musei Capitolini, Rome selected the third for this museum in 1812. It was returned to San Domenico in 1817. The panels in San Domenico were moved to the Galleria Nazionale in 1860. They were assembled in a new frame in 1915, together with copies of the missing predella panels. This altarpiece, which came from San Domenico, is attributed to Benedetto Bonfigli and probably dates to the period immediately before his visit to Rome in 1450. Like many works in San Domenico, it was probably removed from its original location after the collapse of the vaulting of the nave in 1614. It is now in the Galleria Nazionale. This panel is sometimes associated with payments made to Benedetto Bonfigli and Bartolomeo Caporali in 1467-8 according to the will of a merchant, Francesco di Pietro for an altarpiece for the Cappella di San Vincenzo Ferreri. However, this work would almost certainly have included a figure of St Vincent: that does not rule out a polyptych with the present panel at its centre, although, given its size, the panel was more likely to have been an independent altarpiece. The panel depicts the praying Madonna against a rocky landscape. Vertical lines to either side of her suggest the back of a throne. The baby Jesus reclines confidently on her lap, holding Himself in place by clutching her gown, while four kneeling angels to the sides play various musical instruments. This altarpiece, which is presumably the first of these, was first recorded in 1548 in the Cappella dei Magi of San Domenico. The merchant, Nicolò di Gasparo di Lello commissioned the chapel in 1464-6, and it seems likely that he also commissioned this altarpiece for its altar. Like many works in San Domenico, the altarpiece was probably removed from its original location after the collapse of the vaulting of the nave in 1614. It was recorded in the convent in 1683 and in the church in 1712. Although it was listed among the works to be sent to the Musei Capitolini, Rome in 1812, it was subsequently decided that it should remain in the church. It was transferred to the Galleria Nazionale in 1863. In the main panel, the three kings present their gifts to the baby Jesus, who is on the lap of the Madonna and flanked (as in a conventional sacre conversazione) by SS John the Baptist and Nicholas of Bari (the name saint of the presumed donor). The figures are placed in front of the crumbling stable, which is set in a rocky landscape outside the walled city of Bethlehem. ✴a miracle of St Nicholas of Bari. This altarpiece is described in the page on the Cappella di San Lorenzo. The name “Dignamerita” is a reference to the Roman martyrs recorded as SS Digna and Emerita, who were possibly a single person. The figure in this panel holds a fish with a ring in its mouth, for reasons that are now unclear. viving panels are now in the Galleria Nazionale (Room 15/16). This panel, which is attributed to Giannicola di Paolo (or sometimes to Giovanni di Pietro, lo Spagna), was painted soon after the death of the Blessed Colomba and was probably placed over the altar in San Domenico that housed her relics. It was subsequently moved to the adjacent convent and entered the Galleria Nazionale in 1863. There is a copy (18th century) of this panel in the Cappella della Beata Colomba (the 1st on the right) in San Domenico. The panel depicts the Blessed Colomba standing on a terrace set in a landscape. She holds a dove, a rosary, a small wooden cross and a lily. The hand of Jesus appears in the top right hand corner, offering her the Host. The inscription along the bottom that identifies her seems to be a later addition. 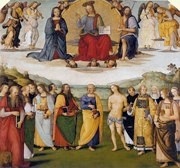 This altarpiece (of All Saints) by Giannicola di Paolo was commissioned for a chapel in San Domenico according to the terms of the will (1493) of Margherita della Corgna, the wife of Baglione di Ugolino dei Montevibiani. Giorgio Vasari recorded it in situ in the 16th century. Although the altarpiece was listed among the works to be sent to the Musei Capitolini, Rome in 1812, it was subsequently decided that it should remain in the church. It entered the Accademia di Belle Arti in 1810 and was subsequently moved to the Galleria Nazionale. In the upper part of the altarpiece, Christ appears in glory in a mandorla between the Virgin and St John the Baptist, with pairs of musical angels to the sides. A number of saints witness the scene from below: those that can be identified include SS Jerome, Nicholas of Bari, John the Evangelist, Paul, Peter, Sebastian, Peter Martyr, Stephen, Catherine of Siena and Mary Magdalene. ✴SS Mary Magdalene and Sebastian. All the figures are grieving, so they probably flanked a Crucifixion or perhaps a Pietà. This small panel by Giovanni Antonio Scaramuccia, which was originally in San Domenico, passed to the Galleria Nazionale in 1863. It depicts the Madonna and Child in glory: the Madonna passes a rosary to St Dominic while the baby Jesus is about to place a crown of roses on the head of the Blessed Colomba da Rieti, who holds her attribute, a dove. The altarpiece was probably commissioned during the period 1610-2, which was a time of natural disasters in Perugia: the Blessed Colomba points to a putto that holds a plaque inscribed with the antiphon: “Parce, Domine, parce populo tuo” (Spare your people Lord). This panel by Giovanni Andrea Carlone from the right wall of the Cappella di San Vincenzo Ferreri (the 2nd chapel on the left) is now apparently in the convent. The saint is depicted as an artist, and his face is a self-portrait. The following precious items are all exhibited in Room 17 of the Galleria Nazionale. It seems that Pope Benedict XI had these precious items with him when he died at Perugia. He had probably intended to give them to the friars of San Domenico since the enamels of saints around the base of the chalice include SS Herculanus and Lawrence, two of the patron saints of Perugia. Both the chalice and the paten, which has an enamel of the Ascension at its centre, are mentioned in the two oldest inventories from San Domenico, respectively dated 1417 and 1430. The chalice continued to be recorded there until 1863, when it was moved to the gallery. The paten was among a cache of precious objects that was discovered under the floor of the choir in 1954, at which point it was reunited with the chalice in the gallery. The design of the chalice is similar to the chalice (ca. 1290) by the Sienese Guccio di Mannaia that Pope Nicholas IV gave to the Franciscans at San Francesco, Assisi (which is now in the Treasury there). The artist responsible for the San Domenico chalice and patens seems to have been a follower of another Sienese, Pace di Valentino. ✴the enamel at the centre of the other one depicts the Resurrection. Each of them had been recorded, along with an accompanying chalice, in the sacristy in the inventories of 1430 and 1458. Both chalices were subsequently lost, but that corresponding to the first paten had been inscribed with the signatures of the Sienese Tondino di Guerrino and Andrea Riguardi. It is likely that the second chalice and both patens also came from this workshop. This paten, which has an enamel of the Annunciation at its centre, was rediscovered under the floor of the choir of San Domenico in 1954, when it was moved to the gallery. It might have been the paten recorded in the sacristy in the inventories of 1430 and 1458, together with an accompanying chalice (which was subsequently lost) that had been inscribed with the signatures of Ugolino di Vieri and Viva di Lando. These objects, which were recorded in the sacristy of San Domenico in the inventories from 1417 onwards, remained there until 1863, when they were moved to gallery. The chalice is inscribed with the signature of Cataluzio da Todi ("Catalutius Petri de Tuderto me fecit"). This reliquary was recorded in the sacristy of San Domenico in the inventories from 1430 onwards and remained there until 1863, when it was moved to the gallery. It may have been made in Todi by a follower of Cataluzio da Todi. The niche in the upper register once contained two of the fingers of St Anne, the mother of the Virgin, but these were apparently stolen in 1609. The niches in the lower register contain statues of the Madonna and Child and of SS Dominic and Thomas Aquinas. This gilded copper tabernacle from Santa Giuliana, which was probably commissioned from a Sienese workshop, originally contained a reliquary that in turn contained a piece of the skull of St Juliana. The relics of this saint had been translated from Cuma to Naples in 1207, and this fragment subsequently passed into the possession of the friars of San Domenico. They enclosed it in a reliquary bust of the head of St Juliana, which was inscribed with the additional information that it had been made in Rome by Master William. In 1376, Bishop Andrea Bontempi persuaded the friars to give the relic and its reliquary to the nuns of what was then the Monastero di Santa Elisabetta, where his sister, Gabriella was the Abbess. The nuns changed the dedication of their nunnery to Santa Giuliana. ✴The reliquary remained in Santa Giuliana until the late 19th century. It appeared on the market in 1933 and was bought by the Metropolitan Museum, New York in 1961. ✴The gilded copper tabernacle that they commissioned to house it is now in the Galleria Nazionale (link above).